If you have any fondness, solid love for, or believe in Jesus Christ and God, you should probably stop reading right now. The infamous Deicide, led by the equally notorious frontman Glen Benton, is back with a blasphemous new album to smite all believers in the false prophet. Or so goes the lyrical theme which Deicide has applied to one classic death metal album after another since the band’s inception back in 1989. Back now with their twelfth full-length, little was bound to change, and with a straightforward, in-your-face title like “Overtures of Blasphemy”, one should immediately get a fairly good idea of what the album is going to be about. But does it fare well against their earlier works, or does Decide simply sound like a broken record on it, like so many of their peers have done on recent albums? Starting out with “One with Satan”, the pace of the record is set to a take no prisoners style of death metal: fast, blistering and ferocious with little room left in which to breathe. Benton’s familiar harsh roar fills the fast-paced track, which rarely loses its alacrity as all of the instruments pound their way through this fierce album-opener. Just like the second track, “Crawled from the Shadows”, the songs subscribe to a pretty straight-forward death metal formula of plenty of tempo shifts and lots of guitar solos — which might sound like a bit much this early on the record, especially when so many of the tracks are built around this pattern. Not until the third song, “Seal the Tomb Below” — arguably the best track on the album — is the listener treated to something more out of the ordinary. Starting with a riff not unlike those churned out by the Polish death metal veterans in Vader, the song structure already sounds more captivating than on the former two tracks. 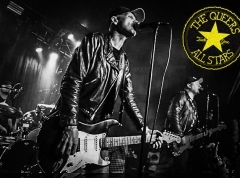 This is mainly because of the clever usage of the lead guitar, with the song built up around the solo-style pieces of melody that vary throughout the song. Instead of just being a somewhat random, or maybe even a misplaced guitar solo, you can really hear how the pieces progress and evolve with the song itself, which, finally towards the end, erupts in a pretty good and more classic type of solo. Sadly, this track doesn’t even reach the 3-minute mark, but it nonetheless bodes well for the rest of the album. The LP rarely slows down, continuing its barrage of anti-Christian slander that fans of the band have been familiar with for ages without relent, as also seen on “All That Is Evil”, which contains a memorable main riff worth taking note of. Where some albums tend to have the best tracks on either the first or the last half of the album, “Overtures of Blasphemy” seems to have evened them out, so that some of the better songs are actually found on the latter half, as evidenced by “Anointed in Blood”, which kicks off with a Vital Remains-esque guitar intro. Apart from sharing the same amount of hatred for Jesus Christ and of course Benton on vocals some years ago, the two bands also share much of the same death metal-sound. But even though this album is a rather a consistent listen, it does end up feeling a bit lackluster after several listens, when one compares it to Benton’s previous band. Where Deicide nowadays falls short is in the diversity of the songs — or rather, lack thereof. 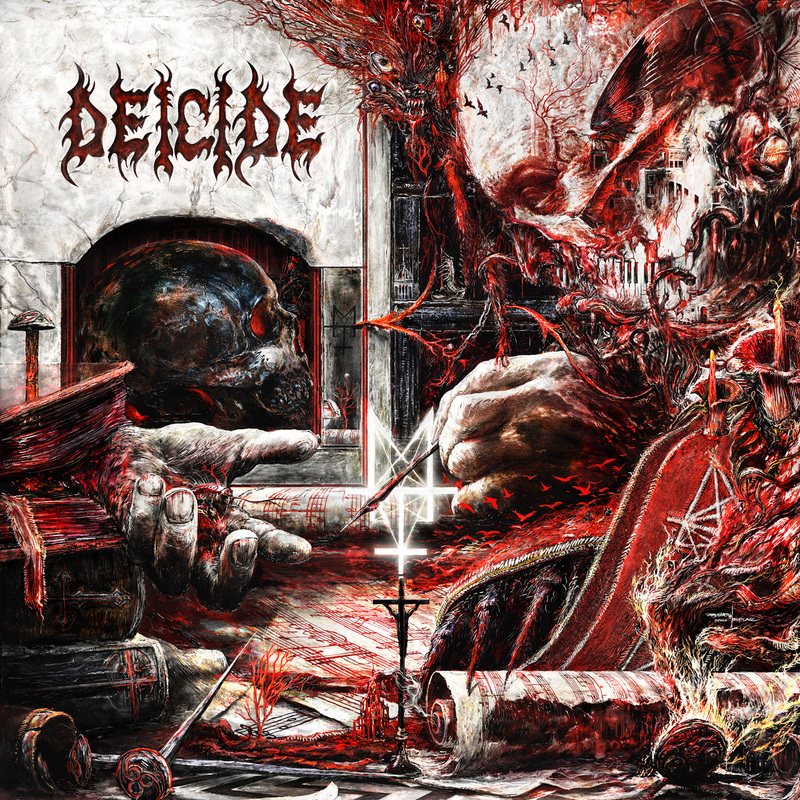 The problem with this record is plain and simple that many of the tracks sound too similar and do very little for Deicide to continue standing out amongst the masses of death metal bands out there. When compared to one of their previous albums, “To Hell with God” from 2011, or even the latest outing, “In the Minds of Evil” from 2013, “Overtures of Blasphemy” seems sort of inferior. Even though the production is crisp, it feels like the overall soundscape still lacks that final punch and power needed to reach those higher grades. Benton’s harsh growls are still very much recognizable, the drums still tight and precise, and the guitars still blaze away. But the combined effect of all the instruments together just does not come across as that memorable this time around. In a few years, I’m fairly certain that I will simply have a hard time distinguishing many of the songs from one another. When one knows one’s death metal history, Deicide will most likely figure in the absolute top with classic death metal albums like their self-titled outing, or “Legion”, but this is not the case for “Overtures of Blasphemy”. It still contains some smashing death metal bangers like the ones mentioned in the ‘download’ section below, but when it has been five years since Deicide last put out an album, one could’ve hoped for the quality of the group's signature anti-religious pummelling to have been more consistent.